TORONTO -- Amir Johnson saw it coming. "We know this is the best team in the East, and we definitely want to go out and get this win," Johnson said before he and the Toronto Raptors hosted the Indiana Pacers on Wednesday night. "With the support of our fans and hard play, we're gonna do that tonight." At the final buzzer, Johnson raised his arms in celebration of a gritty 95-82 win, then he high-fived a few fans who were having an extremely happy new year. "Honestly, that was probably the best crowd I've seen since opening night of last year," said Raptors point guard Kyle Lowry. 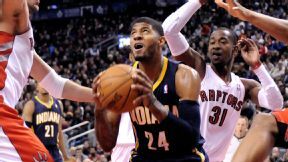 Mark Konezny/USA TODAY Sports Indiana's Paul George could only muster 12 points in Toronto. "That's what we needed in this building. We want our fans to have a reason to cheer and I think we're giving 'em a reason to cheer." Opening night of the 2012-13 season was also against the Pacers, and it was similar most of the way through. That Toronto team held a lead going into the fourth quarter, but Indiana fought back and won by two. "Usually when teams hit us with a blow, we kind of lay down," Johnson said. "Now it's in reverse. We don't lay down. We hit 'em right back, and we're able to get those games now." The Raptors have won eight of their past 10 and are 9-3 since trading Rudy Gay to the Sacramento Kings on Dec. 9. With some observers expecting the team to tank the season, they came back from a 19-point deficit in Dallas to get an overtime win. Then, in Oklahoma City they came back from 11 to beat the West's best team. Now they've beaten the East's best, too. "Those are like springboard games," said Pacers coach Frank Vogel. "There's a residual effect that carries with you over the next period of games or next stretch of games. You just play with more confidence, more belief, more togetherness, and that's what they're going through right now." As Greivis Vasquez sat down at his locker next to Johnson, he told the power forward that Johnson was the man the media should be speaking to. Johnson, after all, is the one who screened for every shooter. "Every shot we made was because of you," Vasquez told him. As the conversation continued, the exuberant Vasquez talked about how happy everyone is to come to work when teammates are sacrificing. Johnson's statistical contributions didn't stand out compared to the team's other starters, but he played near-perfect post defense against Indiana bigs David West and Luis Scola. "[Johnson] does so much for this team that sometimes goes unappreciated, but he knows how much we value him game in and game out," said Raptors forward Patrick Patterson. "No one on this team is selfish; everyone accepts their roles. No one wants to get more shots, no one wants to do more of this, no one is jealous of another player ... we all understand what we have to do in order to make this machine keep rolling smoothly." If Johnson is the personification of Toronto's style of play, Lowry is the machine's engine. He's averaging 17.6 points, 8.7 assists, 4.8 rebounds and 1.8 steals since the Gay trade, with coach Dwane Casey recently calling it the best stretch of Lowry's career. It's Lowry's contract year, he's been in trade rumors and he's forcefully proving his worth. Against Indiana, the biggest play of the game took place with 3:25 left in the fourth quarter, the Raptors up by seven points. That's when the 6-foot Lowry stepped up and took a charge to draw a sixth foul on the Pacers' 7-foot-2 Roy Hibbert. The arena erupted as the center made his frustrated walk to the bench. "We see the stats every single day on the TV screen," Patterson said. "What you see [Lowry] do game in and game out, what you see him do on the practice court, just his demeanor, his approach to the game every single day, he is one of the top point guards in the league in my opinion. ... He's always making that game-changing play. He's always either getting a stop, taking the charge like he did or hitting a big-time shot." With the team coming together as most of the East falls apart, the ever-confident Johnson was asked if the 15-15 Raptors are the third-best team in the conference. "No. 1," he responded with a sly smile. "When your heart is in a good place, nobody has no complaints," Johnson said. "Everybody's just on a roll right now. What can I say?" MVP: Terrence Ross came up huge Wednesday night. He scored 18 points on 12 shots and had three steals to boot, but his biggest contribution was his defense. Ross held George to 5-for-14 shooting from the field. George also turned it over six times. Turning point: Once again, the Raptors ran away with this one in the fourth -- they outscored the Pacers 29-19 in the final frame. The Raptors turned up the defense and got Hibbert to foul out, which opened up Toronto's offense. X factor: The two-headed PG tandem of Lowry and Vasquez combined for 16 assists and shepherded the Raptors through some rough patches in the second and third quarters. MVP: If Blake Griffin wanted to start the new year by quieting the critics, he definitely did an amazing job. With a line of 31 points on 14-of-20 shooting, Griffin did a majority of his damage away from the paint, which should be scary for the rest of the NBA. Turning point: The first half of the third quarter. During that point of time, the Clippers went on an 18-6 run behind the perimeter efforts of Griffin and Jared Dudley. X factor: While Griffin and Chris Paul were the headliners of the blowout, the consistent perimeter play of Dudley helped push the Clippers to victory, as he finished the night with 20 points on 6-of-9 shooting from beyond the arc. MVP: Nikola Pekovic was the unstoppable force and the immovable object Wednesday night, as he controlled the paint for the Timberwolves. The Pelicans' only answer for his brute force was to send him to the line, which resulted in points for Minnesota and foul trouble for both Anthony Davis and Ryan Anderson. LVP: Greg Stiemsma touched the ball four times in the first half, resulting in three Pelicans turnovers. In just six minutes, Stiemsma had those three turnovers, two fouls that both led to free throws. And was minus-13 on the night. That was a ... disparity: In the first half, the Timberwolves shot 24 free throws, compared to just seven for the Pelicans. The Timberwolves were far more aggressive and not only did it help them get free points, but it got all of the Pelicans' key players in foul trouble. The Pelicans never recovered after that. MVP: Michael Carter-Williams. It wasn't the best shooting night for the 6-foot-6 point guard, but he finished with 16 points, nine rebounds and six assists, putting the game away with a clutch jumper late in the fourth quarter. The Sixers are a completely different team when their rookie is on the floor. X factor: Lavoy Allen had a season-high 13 points in only 14 minutes, staying active on the boards and even hitting a 3-pointer -- the second of his career. That was ... a disaster: The Nuggets have dropped eight straight, including five on their home court where they went 38-3 last season. This loss -- a double-digit defeat against a lottery-bound Eastern Conference team -- might be the low-point for Brian Shaw's squad. MVP: Monta Ellis dragged Dallas through an exceptionally ugly game, scoring 23 points and grabbing five rebounds. Fellow starters Dirk Nowitzki and Jose Calderon were a combined 6-of-28 from the field, forcing Ellis to shoulder the scoring burden. Defining moment: With Dallas up 75-74 with less than three minutes to play, Vince Carter goaded Trevor Ariza into a perimeter foul, putting Carter on the line. He sank both and the Wizards were not able to regain the lead. X factor: Trevor Booker grabbed a ridiculous 19 rebounds. Though he played 30 minutes, he actually grabbed all of those boards in the first three quarters, when he saw only 23 minutes of game action. Blake Griffin, Clippers: Griffin poured in 31 points -- including a few nifty jumpers -- to go along with 12 boards, helping L.A. pull away in the second half against Charlotte. With the game tied 56-56 at the half inside Staples Center, it had the look of a potential Bobcats upset of the Clippers. Charlotte then proceeded to score a grand total of 29 points the rest of the way to get blown out in L.A.
"We don't care who is out there in front of us, we understand that they are going to throw a punch and we're going to throw punches back." -- Raptors guard DeMar DeRozan, on Toronto's win over Indiana. Rick Madonik/Toronto Star/Getty Images Tyler Hansbrough got a crack at his old team as the Raptors stunned the Pacers. As this reconstruction of the Minnesota Timberwolves franchise has been executed over the past few years, the idea of putting Kevin Love next to a frontcourt bruiser never seemed to be high on the list of priorities. Find a scoring forward like Michael Beasley to form a dynamic, productive duo? They tried that. Make sure Ricky Rubio comes over from Spain and starts cashing in on the hype and potential to make him the apotheosis of successful pure point guard play? That's still a work in progress that could be under construction longer than the city planned. Making Nikola Pekovic the bulldozer to Love's wrecking ball may not have been the initial plan, but it has developed over the past three years as Pekovic became a viable option in the paint. When he re-signed with the Wolves for five years and $60 million, new president of basketball operations Flip Saunders seemed to have a vision of how this team would play.